In South Africa there is still heavy reliance on court litigation by parties when it comes to commercial disputes. That is why the Companies Tribunal (the Tribunal) in partnership with the Mandela Institute hosted a seminar aimed at promoting a culture of resolving commercial disputes through alternative dispute resolution (ADR). As a result, several key issues were discussed which enhanced the understanding of ADR in general and how can ADR be utilized to resolve disputes effectively and promote access to justice. 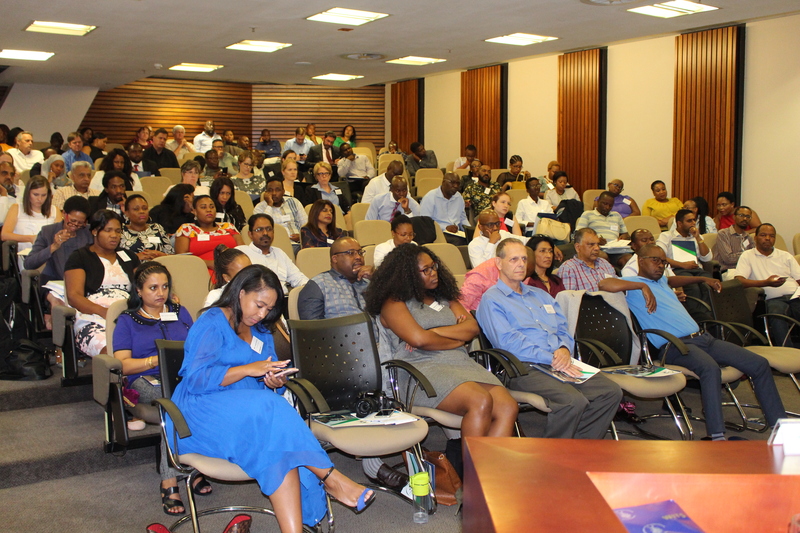 The seminar comprised of a highly esteemed panel from the academia, legal and business fraternity as well as government and took place on 26 February 2019 at Wits University. Hosting the seminar with the Mandela Institute befitted the theme since Institute is named after Nelson Mandela a global icon who stood for reconciliation and strived for alternative ways to resolve disputes. The esteemed panel comprised of Wits University’s Professor Tumai Murombo who was the programme director, Mr Macdonald Netshitenzhe who is the Chief Director for Consumer and Corporate Regulation Division at the dti, Ms Judith Katzew Lecturer at Wits School of Law, Mr Alan Mukoki CEO of the South African Chamber of Commerce and Industry, Mr Ebrahim Patelia from the Law Society of South Africa and a panel of three Tribunal members, Ms Khatija Tootla, Mrs Matshego Ramagaga and Mr PJ Veldhuizen. Tribunal’s Chairperson Dr Mohamed Alli Chickay opened the seminar and stated that we are having this seminar as a means to change the way we think of conflicts and tribunals should be the first port of instance to resolve disputes before we drag each other to court. He encouraged delegates to think of other ways of resolving disputes. The Chairperson was followed by Mr Netshitenhze who delivered key note address from the policy perspective and indicated that he had discussions at the department of Trade and Industry on why there was no clause in the Companies Act which states that people must not go straight to court with their dispute, but rather start at the Tribunal, where the Tribunal will help to talk about issues the parties have. He added that he would like to see conflict resolution, mediation and arbitration being promoted at institutions of higher learning so that it becomes a culture when people want to resolve disputes. He said it will be difficult for students who have not been taught ADR when they enter the system because when a dispute matter arises they will be unable to resolve it since they were not trained in mediation and will instead start coming up with heads of argument. He pointed out that universities should, empower students with ADR and also encouraged the Chairperson to ensure the Tribunal is not clogged by processes that end up confusing the litigants. She believes that therapeutic and settlement model work best in South Africa because in both these models the concept is to compromise and settle but ultimately to maintain and restore the relationship between the parties. She also proposed that South Africa should benchmark with Nigeria’s Lagos Multi-Door Courthouse system. The Tribunal member panel discussed on whether has the Tribunal been able to carry out ADR mandate as contemplated in the Act, reflecting on the challenges, opportunities and lessons learnt. Public awareness was identified as one of the key measures that needs to be intensified because the Tribunal is not receiving a lot of ADR applications. Pushback from the Judiciary and the legal profession was also identified as a possible challenge due to the perception that mediation is a shortcut to a settlement and will take money away from lawyers. Tribunal member, Matshego Ramagaga disputed this saying that she doesn’t believe that legal practitioners have not been promoting ADR because they fear that they will be out of business. She pointed out that whether there is a recession or when the economy is at its best, legal practitioners will always be needed. Their role during mediation is not to represent their clients but to advise them. Good faith by parties was also encouraged for mediation to be successful and legal practitioners should persuade their clients to go for mediation. Training of judges and magistrates was also identified so that they advise parties to consider settling the dispute with the Tribunal. Legal practitioners were also encouraged to be advocates of ADR. It was advised that companies should build in a clause into every contract which provides that in the event of a dispute the first port of call must be the ADR. Mr Alan Mukoki presented on how can the Tribunal’s ADR mechanism be of benefit to business. He stated that ADR should be quick, cheap and effective. But he challenged everyone to reflect on what is our purpose? what are the needs of business, small businesses and big businesses? And whether are we responding to those needs? Closing the seminar was Mr Ebrahim Patelia, who presented on the role of the legal profession in promoting ADR. He concurred with the previous speakers on the concept of appropriate dispute resolution and stated that government needs to provide policy certainty for any legal system to take root. However, he warned against the privatisation of the judiciary by creating private structures that are mainly populated by people who do not want or trust transformation of the judiciary. He believes that if you are building your dispute resolution processes, you need to incorporate the lawyers because they play a role to support the structure and make the choices in terms of dispute resolution. It was agreed that lawyers need to create departments, mediation units in their practices, whether it is in a law firm or whether it is in the Bar Association. And it was emphasized that ADR training for law students should be part of the curriculum provided by academic institutions. The seminar brought a number of issues that should be considered by the Tribunal when it comes to statutory reform and effectiveness. More seminars like these will be held with other academic institutions because academics play a crucial role in shaping opinion and moulding society in general. Academics can play an important role in how society looks and deals with disputes.